Contact the owner Orval @ 561-758-2188. 2009 Mariah SC 19,One owner (ex-Coastie) bought new in 2011. 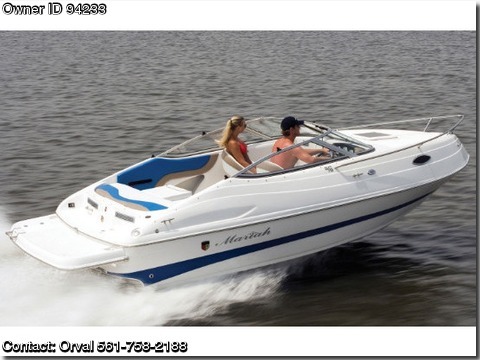 300 Engine Hours on 135 HP Mercruiser 4 cyl with scheduled maintenance at 20, 150 and 300 hours. Seats 5 comfortably will hold 10 when packed (1500 lbs).All Coast Guard required gear (plus toilet, dock lines, tow line, boat hook, 2 anchors, 5 fenders, 2 swim bouys, cleaning tools/supplies & more) included. 6 lifejackets and boat cover with bungy ties included. Portable grill included.Single axle leaf spring aluminum trailer (rarely used) included. (2013 PB County Parks and Rec ramp pass included.) Boat can be seen at PGA Marina / Palm Beach Gardens, FL sea trials welcomed.